In the interests of family harmony I would advise against doing your weekly shop at 8 am on a Saturday. We do ours then and gosh, what a fraught experience it is. One such Saturday found me in the frozen section of our Waitrose trying to cool off and lo and behold – my eyes fell on a Waitrose Frozen Vibrant & Warming Chicken Biryani. Here is how it works (of course I bought it! What do you think? ): You empty the frozen contents of the pack into a saucepan add a bit of water and stir until all the frozen lumps have melted away. Sounds awful doesn’t it? 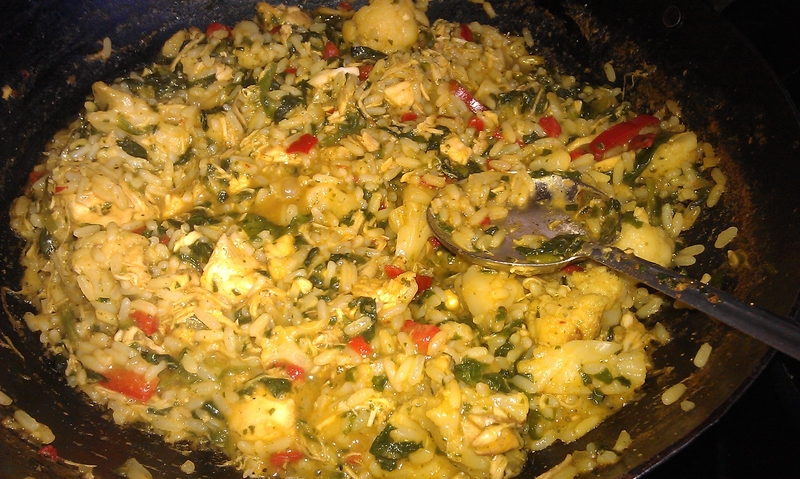 But no, it looked really good and along with the chicken was packed with healthy unbiryani-like stuff: spinach, cauliflower and red peppers. The husband made me add some boiled eggs to the finished product and we were ready to go. Erm – it was quite delicious but did not taste like a biryani at all, in fact there was consensus on the dining table that it actually tasted like paella. Still, like I said quite delicious and did feel nutritious in a very “I am ill, I need to eat this” kind of way. However, when the family broke out our trusty Haldiram Khatta Meetha Namkeen as garnish on top of the biryani to spice it up and make it eatable – I knew we would never be having it again. Ah, well I just have to find something else to calm me down on my Saturday morning weekly shop. 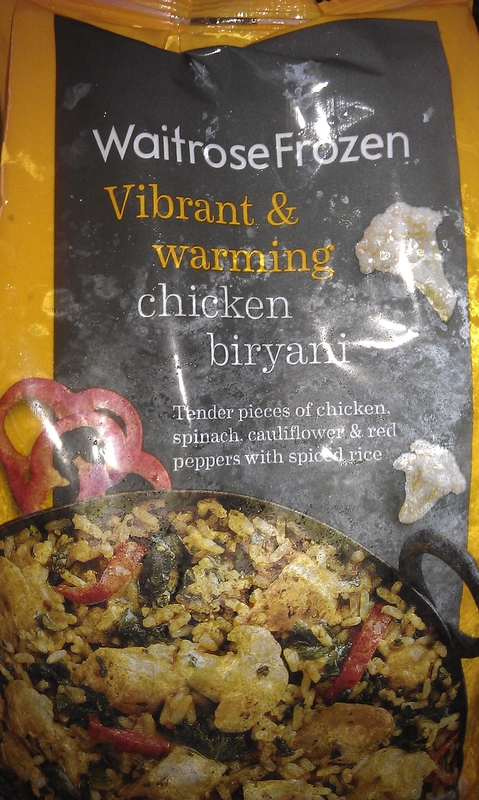 This entry was posted in Biryani and tagged biryani, chicken biryani, Indian takeaway, rice, waitrose, waitrose frozen hot and vibrant chicken biryani, waitrose frozen products by Poornima. Bookmark the permalink.